Lane Fritz doesn’t find it easy but he’s trying to read his Bible more and encourage others to do the same. That’s why you’ll sometimes see the Modoc, Indiana bull rider take a break during from the action at a bull riding to open it up and read it. “When other guys see me reading it, they stop and ask what I’m reading,” he said, hoping that when others see him doing it, they can feel more comfortable opening theirs. He recently gave his King James bible to a friend who didn’t have one but got a new Holman Study Bible from his church for graduating high school. 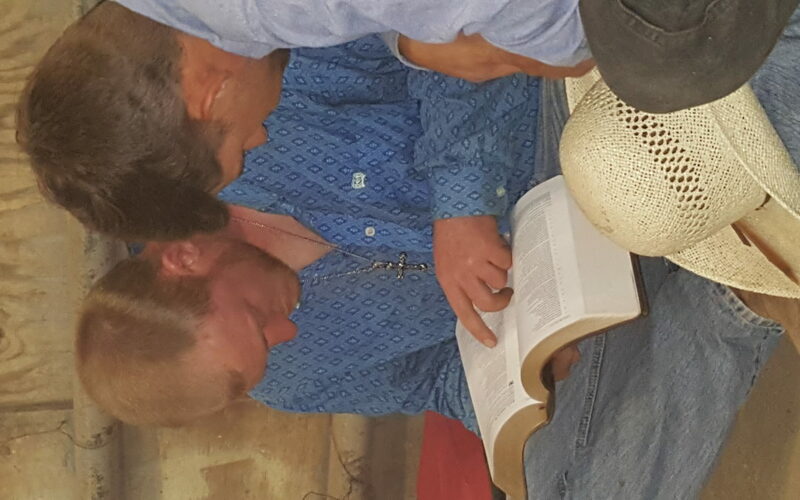 This past Saturday, Fritz had sat down behind the bucking chutes and opened the Bible up to a random Psalm and began reading when a traveling partner, Cody West, crouched down with him to see what he was reading. They were at The Mack Arena, a Southern Extreme Bull Riding winter series run by Joe and Amy McQuillan. The event has been held all fall through spring for more than 15 years and is one of the places many Ohio and Indiana bull riders strengthen their grip on bull riding. It was the last night for the series and the second time this year that I got to go to lead cowboy church behind the chutes. I talked with Fritz and West a little about their Bible reading and West asked a question that most rodeo cowboys and bull riders have: what’s the best way to read it? Fritz said he mostly just opens it up at random to try to learn something and I was able to encourage him to use the study notes that come with the Bible and focus on reading smaller amounts at a time to be sure he understands what he’s read before moving on. He said not knowing who all the people are and how they are connected makes it confusing. He also said the ‘slang’ in the language is sometimes hard to understand but he is wanting to do better at reading his Bible more. I went over a few basics to try not to overwhelm them and suggested to him and West that they start with John to learn more about Jesus and the gospel first but that they also might try James as a shorter book but one that is more to the point. I find for the cowboys and bull riders just getting started with their Bibles, that sometimes that is an easier book to get comfortable with studying the Bible in general. It can be hard to get participation but I’ve started a group to do an online Bible study and will be including the people who have normally come to the cookout/Bible studies we’ve done in Ohio in the past as well as anyone else who has a genuine interest in learning more about the Bible. The text-based format will make it slow going but there will be a chance for the guys (and a few spouses) to answer questions after looking at sections of scripture to help them understand the text better. Many of the guys carry Bibles with them but it seems less often that you see them open it up. I used to give away what are known as ‘cowboy Bibles’ which are inexpensive New Testaments designed to be compact and kept in their gear bags or glove boxes. They have rodeo-related covers on them and some are printed with cowboy testimonies in them. I switched a few years ago to giving out compact Bibles I can sometimes get at a chain of Christian bookstores for just a little more than the cost of the cowboy Bibles, but that way, they have the complete set of Scriptures. They have tooled covers that fit the cowboy style and for those I know are really trying to understand their Bibles, I will get them a study Bible. It’s always exciting to me to see someone bring theirs into the group when gather for cowboy church. I know another bull rider who also happens to be from Indiana who will slip away somewhere before the bull riding starts to read some from his away from the distractions around him but Fritz said he prefers to read his in the open to be an encouragement to others. It was definitely an encouragement to me to see the two of them talking about what Fritz was reading.